"What is Alpha Anywhere and why are Companies, Developers and Domain Experts turning to it?" The problem that Alpha Anywhere addresses. The demand for mobile-enabled business applications is growing rapidly because business and organizations recognize that customers, clients, patients, students, partners, prospects, suppliers etc all want to interact with their organization anywhere, anytime from any device. What does this mean for organizations, IT developers, business domain experts and system integrators? They have to get these applications built in a timely manner, but also they must ensure that they work well and can stay updated on an evolving array of PCs, laptops, smartphones and tablets. Compounding the problem is the acute skill set shortage which exists because the creation of modern business applications is very complex and requires developers to have a myriad of front-end and back-end skills on platforms that are quickly changing. Companies are thus looking for new development solutions that allow the developers they currently have to become mobile-capable fast and then to quickly build critical business applications from one code base that deploy on all devices easily. This diagram below illustrates the fact that by leaning Alpha Anywhere a developer does not have become an expert in a huge array of front end and back technologies This is where Alpha Anywhere fits in. 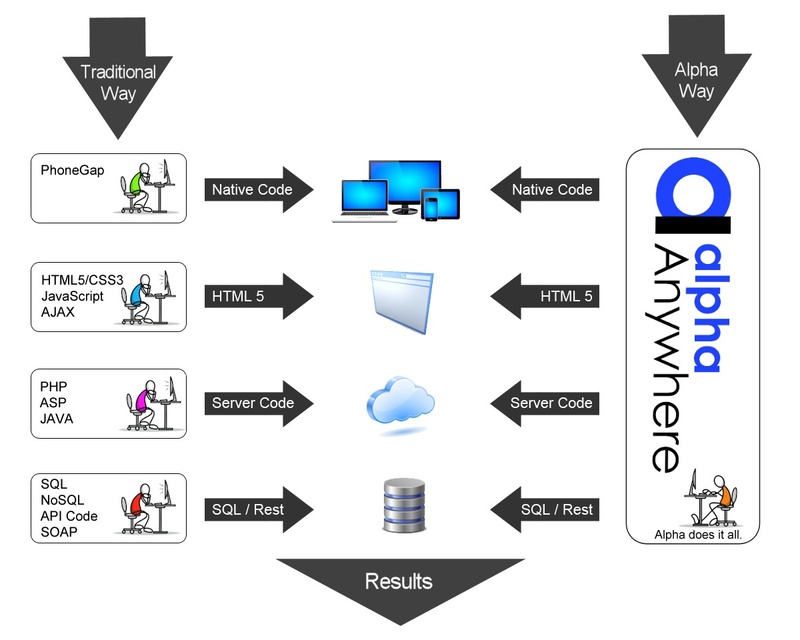 Alpha Anywhere, is a complete “coding-optional” platform for rapid development and easy deployment of responsively designed business applications from one code base that are robust and secure: Enterprises can now easily create applications once that automatically adapt for use on smartphones, tablets, PCs, Macs, Chromebooks, or touch-enabled computers. Alpha Anywhere is built to serve the millions of small to large businesses who are urgently looking to incorporate mobile applications in their day to day operations to ensure they remain competitive. Alpha Anywhere’s key differentiation points are that it: 1- Enables mainstream developers to rapidly build secure mobile and web business applications responsively in HTML5 (soon to be the dominant approach for mobile applications, according to Gartner). These applications can then be turned into native applications very easily using Alpha Anywhere’s fully integrated “PhoneGap” support ; 2- Includes everything needed in one system to build and easily update these applications, from back-end services to front-end GUI, using built-in (or 3rd party) components such as reporting, forms, charting, scheduling, video/image handlers, and GIS. 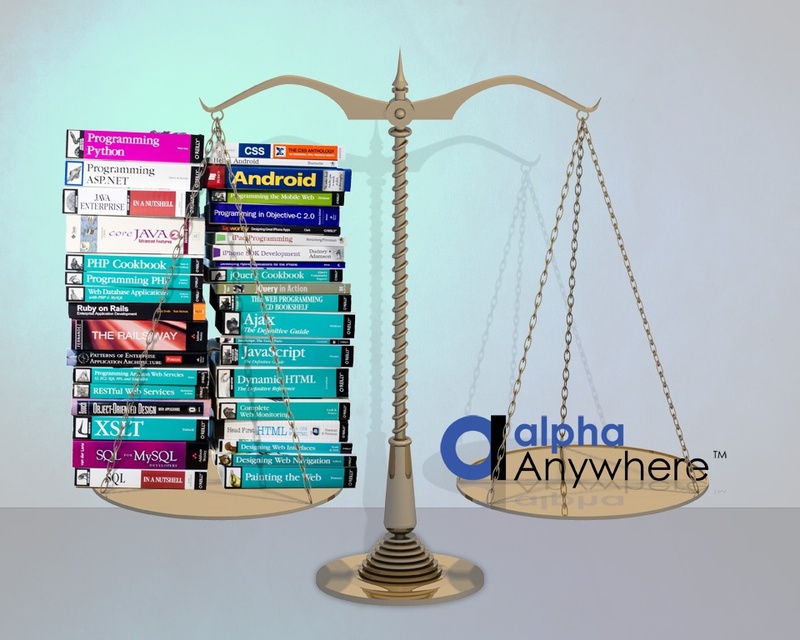 It is entirely realistic for one developer to master Alpha Anywhere and be able to build complete mobile and web apps. (See figure 1 below) 3- Has seamless integration with SQL databases, other corporate data-sources and data from web services; 4- Will soon Offer an easy method, where coding is not required, that enables mobile apps to run disconnected or on intermittent internet connections – research indicates that offline support is a critical concern for almost 90 % of corporate clients. 5- Easy Cloud or ISP deployment, or deployment to the customer’s own servers; and soon will allow 'One-click' auto-scale deployment to the Alpha Cloud. Customers Over the years, thousands of developers have built tens of thousands of business applications using Alpha's previous generations of their application development platforms – but this latest generation, which addresses the thorny issues raised by the arrival of mobile devices, moves the Company to a whole new level.